Keeping a wound warm is an important part of wound care treatment, and foam dressing does the trick because it effectively maintains optimum temperatures and promotes healing. For wound care clinicians – and anyone else who ever treats wounds – it’s important to know that moist wounds heal faster. However, moisture on any surface (including wounds) will begin evaporating when exposed to air, and at a quicker rate as the surface cools. So the challenge of healing wounds effectively is to keep a wound moist and warm. Fortunately, foam dressings maintain optimum healing conditions, and help our patients heal faster. As wound tissues lose moisture, a cooling effect occurs in the wound. Because cells and enzymes function optimally at normal body temperature, a drop of just 2 °C is sufficient enough to negatively affect the biological healing process. In fact, when a wound dressing is changed, it can take a wound base temperature up to four hours before it returns to normal. This is an important factor to consider when anticipating healing times, as well as when prepping your patient for a dressing change. Additionally, when tissue cooling occurs, it can lead to a higher risk of infection due to vasoconstriction, and hemoglobin’s increased need for oxygen. This, in turn, decreases the amount of oxygen available for neutrophils, which fight infection. So how does this all tie in to dressings? 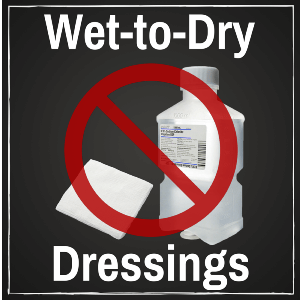 By using the right type of dressings – and applying them properly – you can create an optimum environment for wound healing. The dressing that keeps the wound bed the warmest is foam. Knowing that moist and warm wounds heal faster obviously makes using the right dressings (and applying them properly) crucial to effective wound care. Do you regularly use foam dressings, and have you noticed a difference in healing time? And have you learned any special application techniques that help keep wounds at an optimum body temperature? We’d love to hear about your experiences – please leave your comments below. Why do we do what we do today in wound care? Modern wound management all started back in the 1960’s when Dr. George Winter found that wounds that were kept moist healed twice as fast. By keeping the wound environment moist it mimicked the natural environment of the cells in the body and we had decreased cell death, increased angiogenesis or new blood vessel formation, enhanced autolytic debridement, increased re-epithelialization and the patient had decreased pain. In short better wound healing was occurring with moist healing principles. More studies continued and focused on water vapor loss, which lead to heat loss of the wound. The loss of moisture from any surface is accompanied by cooling of that surface, and when the wound loses tissue moisture there is cooling off the wound. Epidermal cells will only migrate over viable tissues; a dry crust or scab impedes the resurfacing process. Our wounds need to be maintained at or near normal body temperature to heal. A drop in temperature in the wound bed of 2°C is sufficient to alter healing and slow or stop healing, and it can take up to 4 hours for that wound to get back to normal healing temperature! As our wound cools off other negative things occur too, vasoconstriction occurs and the wound bed doesn’t get the needed blood and oxygen for our white blood cells to function effectively. This results in the white blood cells not being able to fight off bacteria, and the wound ends up at risk or with an actual infection. In summary, for wound care, the 1960’s were really the start of something great! Faster healing times and better out comes for my patient! We now practice moist wound healing principles, we know the wound needs to be kept warm and moist, and needs to have a constant supply of oxygen to fight off infection. Today we accomplish this with dressings that support moist wound healing. We use dressings that have the technology to be left in place for long periods of time and keep the wound bed warm. Long gone are the days of TID dressing changes, remember it takes the wound bed 4 hours to return to normal healing temperature! When it comes to modern day wound care, the 60’s is where we still are at!